We drove through Peasmarsh to see if Sir Paul McCartney was out and about, but didn’t see him. Our friends in Rye used to see him quite often back when Linda was alive, but not so much since then. We had a meander through Rye, I nearly fell over on the cobbles (twice) but survived. Historic and charming they may be, but I think cobblestones are a health and safety issue and something should be done!!! At least G managed not to stub his toe, which he seems to do quite often lately with gruesome results. He takes shoe size 12, but when he wears sandals his big toes must be size 14. Not much from me today as the very nice people who judge the Travel Blog of the Year award have requested a ‘travelogue’ post and that’s far more G than it is me. 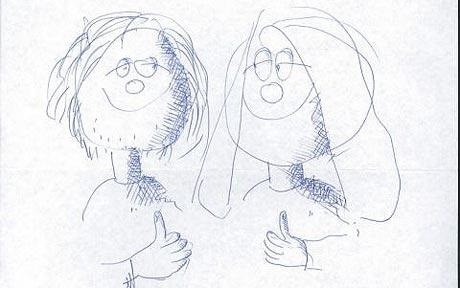 Our blog has been shortlisted and highly commended for the past two years and have recently been told we are on this year’s shortlist too, so I will stop writing now so as they don’t think we just talk rubbish. Which I do. Only some of the time. Dungeness next but you’ll have to wait a bit longer for that. We’re wandering around Kent and Sussex just now, two counties brim full of history and with strong nautical affiliations. Way back in Pre-Norman conquest times; before William made the Sussex towns of Hastings and Battle synonymous with the year 1066, the perceived threat lay not across the Channel in Normandy but in Scandinavia where the fierce Norsemen were a constant threat. For a time England even had a Danish king in the person of Cnut (who we now call Canute) but after his death the Anglo-Saxon Edward the Confessor was determined to keep the Norse threat at bay. The security of England, Edward reasoned, depended on a successful control of the English Channel. To this end he granted the ports of Sandwich, Dover, and New Romney, all in Kent, certain taxation incentives in exchange for agreeing to supply ships and sailors to defend the coasts when required. This was a valuable concession and the three towns prospered greatly as a result. Later, Hastings in Sussex, and Hythe, in Kent were added and these five coastal towns made up the Five Ports (in Norman French they were termed the ‘Cinque Ports’). In the 13th century Rye and Winchelsea also became affiliated with the Cinque Ports. 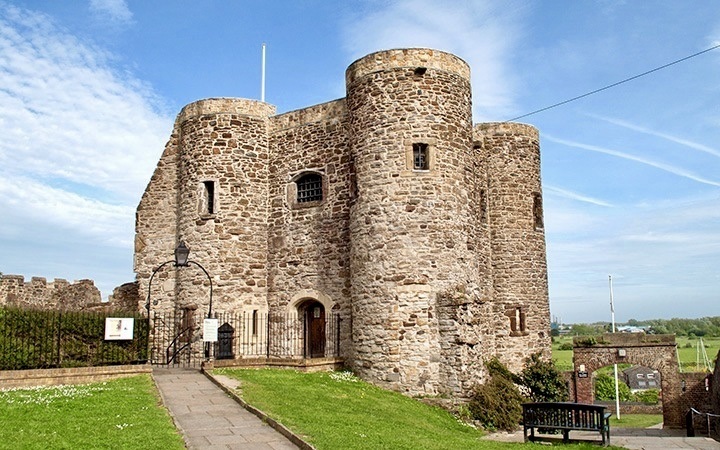 Defence was a major consideration in those uncertain times and other towns joined in including Tenterden becoming an ally of Rye, and Pevensey an ally of Hastings, reaching a total of 42 towns at its medieval peak. A few hundred years saw some of the towns continue to prosper while others declined. Dover’s harbour ensured its prosperity, but elsewhere the sea receded, rivers silted up, leaving Winchelsea and Tenterden totally isolated from the coast and Rye transformed from a former coastal port into a river one. Walmer Castle near Deal in Kent is the official residence of the Warden of the Cinque Ports, a position little more than ceremonial today, but once of huge national importance and previous wardens have included the Queen Mother, Winston Churchill and the Duke of Wellington. I may apply for the post next time it becomes vacant. We noted the black sludge in the river bed as we approached Rye, barely half a cup of water on show, but we know from previous visits the river will be brim full of water later in the day. Initially, we bypassed Rye and made the short trip to Peasmarsh to see if the French ‘jam lady’ was still around. Some years ago we met a French woman who was selling home made jam at a farmers’ market and she also had a stall outside her cottage in Peasmarsh. We weren’t looking to buy jam, just wanted to say hello while we were in the neighbourhood. We offered to drive around the area and report back and were barely out of sight before we found the escapee, safe and sound in the care of a young man who told us this was a regular occurrence as the owner of the horse kept forgetting to close the gate. We thought it unlikely the horse would have gone very far as it was very old and remarkably fat. I told him we didn’t know where Playdon was and he looked astonished. I’ve rarely felt so ignorant. Retracing our steps, we reassured the horse owner that her escaped mare was on the way home and within a couple of minutes passed a sign informing us we were now in Playdon. Half a mile further on and we came to the far side of Playdon. No houses, no people, just a few fields, but there was a sign offering confirmation of the village being mentioned in the Domesday Book. Must have been a bit more lively back in the 11th century. 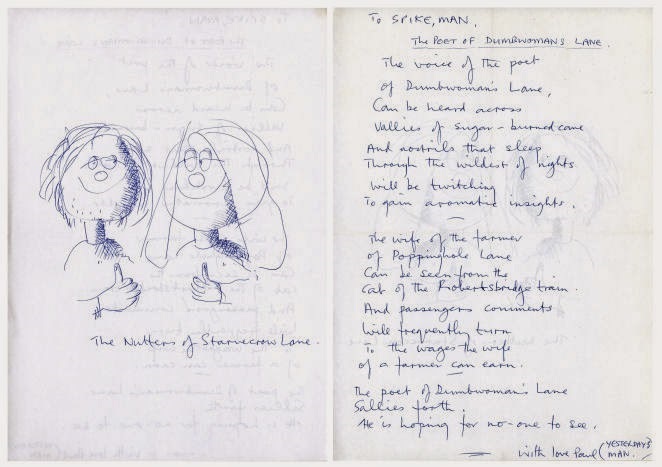 McCartney hand-wrote a short lyric called 'The Poet of Dumbswoman Lane' (referring to Spike’s address) on one side of a piece of paper and drew a cartoon titled 'The Nutters of Starvecrow Lane' on the reverse and it was sold for a large sum when Spike Milligan’s effects were disposed of after his death. Starvecrow Lane is just one of many weird street names in this area. We moved on to Rye, surely one of the most attractive and interesting towns in England and a place we visit often. The street names alone are worth the visit. We wandered down Cinque Street, Pope Walk, Love Lane, and Deadman’s Lane, the latter believed to be the former site where many victims of the Black Death were buried. Rats came off the ships when they landed in port and spread the disease and most sea ports were overrun by the disease. It’s also the lane going up the hill to where public hangings took place. No sign of a hanging today, but the house of one of the men who signed many death warrants, Thomas Lamb, is in Deadman’s Lane. Thomas Lamb was Mayor of Rye twenty times and the Lamb family dominated the town for well over two hundred years. More about the Lamb family coming up! 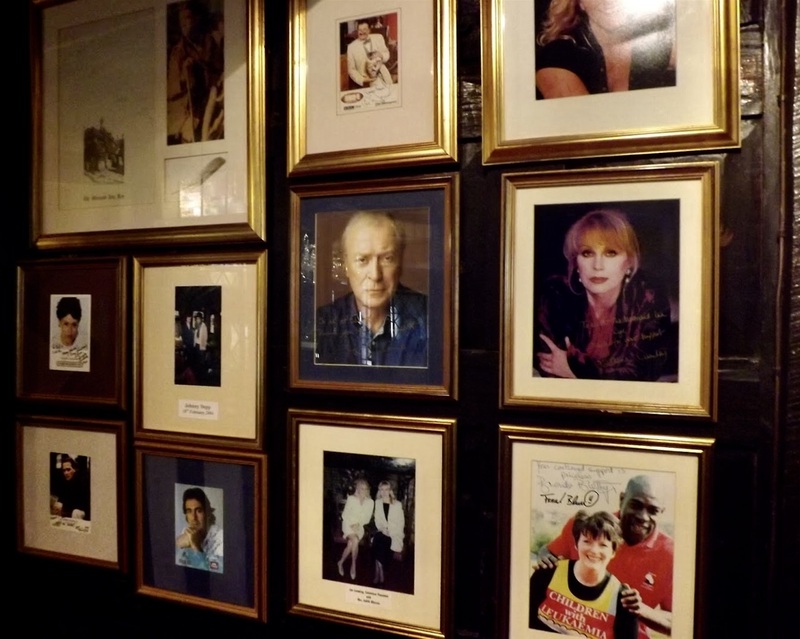 Many famous people have lived in Rye, plus a few surprises such as Bob Marley’s great-grandfather, Frederick, being born in the town in 1820. 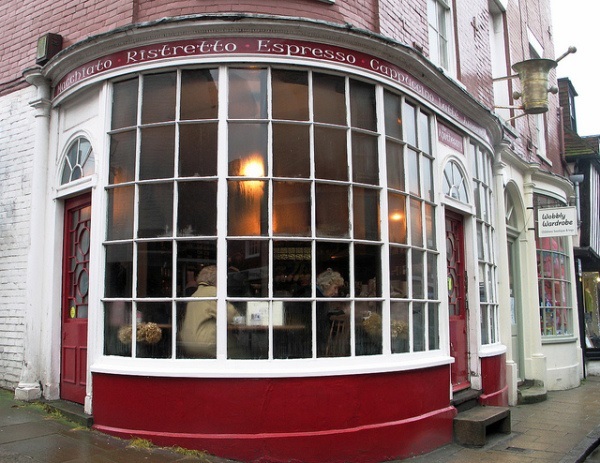 We walked up the hill as far as the castle, browsing the shop windows on our way, then retraced our steps and nipped into the Apothecary, a legendary café and very much a Rye institution, for a quick chat with the staff. 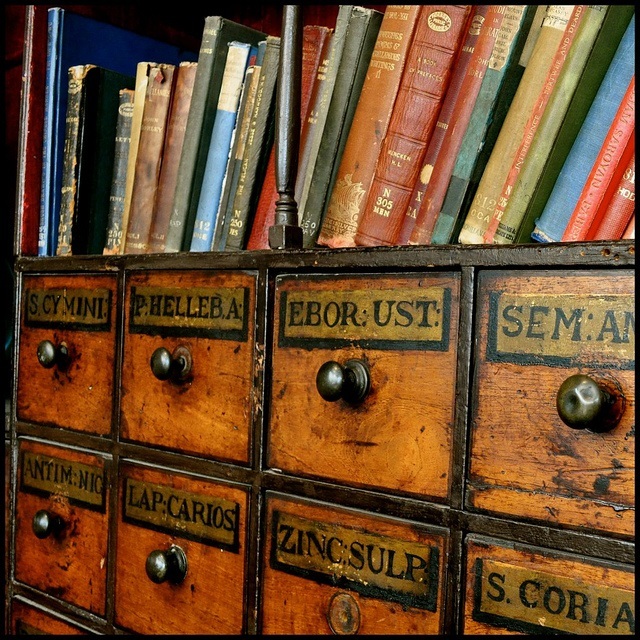 We’re long standing customers and they’re always keen to find out where we’ve been and where we’re going next. Walking past the church and its graveyard, we reached a house with a remarkable history. 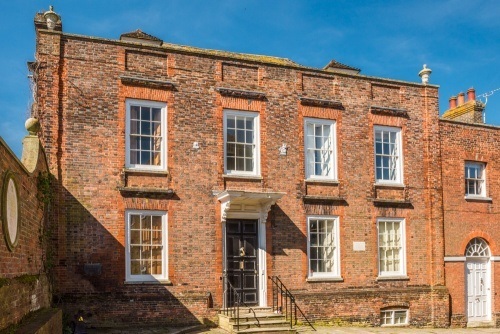 Originally built in 1723 by yet another member of the Lamb family, James (who was Mayor a mere thirteen times), Lamb House is a brick-fronted Georgian house, but its classic simplicity is deceptive. One of the most famous stories about Lamb House concerns George I. In 1726 the King was returning from Hanover to open Parliament when he was driven ashore by a terrible storm and made an emergency landing at Camber Sands. 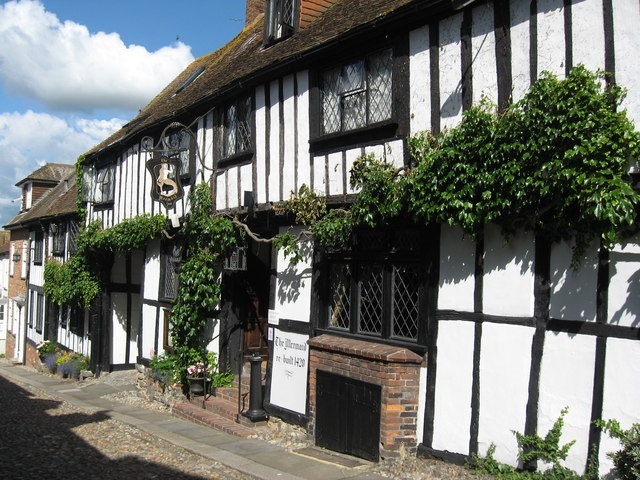 James Lamb escorted the King to his own house in Rye where the family entertained him for three days though George spoke very little English and the Lamb family didn’t speak a word of German. (We can relate to this; even though Marigold seems to manage very well in countries where we don’t speak the language. Romania, Lithuania, Ukraine? No problem at all). On the very first night of the King’s visit Mrs Lamb gave birth to a baby boy. The King agreed to act as godfather at the christening of the baby in St Mary’s church; the boy was named George. Naturally. 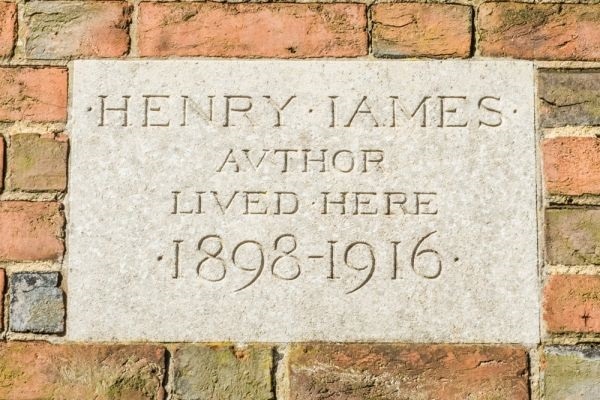 The Lamb family eventually sold the house, leaving its name as a memento, but it came into its own when it was snapped up by the famous American writer, Henry James who spent most of the last eighteen years of his life here. Lamb House provided its owner with the inspiration for many of his most notable books, but it was as a host for other literary giants that the house has achieved such fame. H.G. Wells, A.C.and E.F. Benson, Max Beerbohm. Hilaire Belloc, G.K. Chesterton, Joseph Conrad, Stephen Crane, Ford Maddox Ford, Edmund Gosse, Rudyard Kipling, Hugh Walpole and Edith Wharton all stayed here. 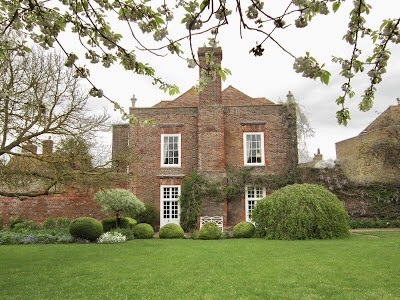 After Jame’s death in 1916 the house became the home of brothers, A.C. and E.F. Benson.The view from the bow window of the Garden House was to give E.F. Benson the inspiration for his Mapp and Lucia novels and thrust the house and the town of Rye itself into the public eye. In Benson’s stories Lamb House became Mallard House and Rye was renamed Tilling. On a previous visit to Rye a few year’s ago, with Marigold’s sister in attendance, we discovered a television crew filming a television adaptation of Mapp and Lucia for the BBC outside the house. Barring our further passage were two signs saying ‘Quiet’ and ‘Please’ respectively. Marigold’s sister said, ‘they surely don’t expect us to walk all the way round’ and set off between the two signs. Anna Chancellor, in mid speech, looked just a little confused at the sudden appearance of a random ‘extra’ and I wish I had taken a photo of the expression on the face of Miranda Richardson! We missed the tv series, but I’m pretty certain they shot another take if that particular scene. Marigold and I, of course, walked the long way round. Beyond Lamb House lies Mermaid Street, formerly the main road through Rye. Imagine explaining ‘Ye Olde England’ to a foreigner. Just bring them to Mermaid Street. Gorgeous old flower bedecked ancient houses, cobblestones underfoot and a pub where the original cellars date from 1156 and bearing a sign saying it was renovated as ‘recently’ as 1420. The Mermaid Inn is fabulous. 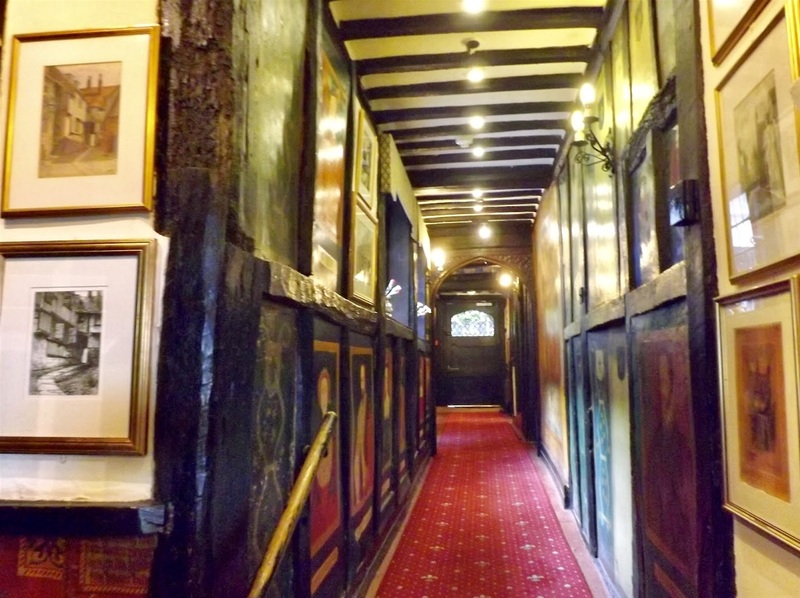 Dark beams, creaking oak floorboards, narrow passages, and winding staircases, it has many a tale to tell. 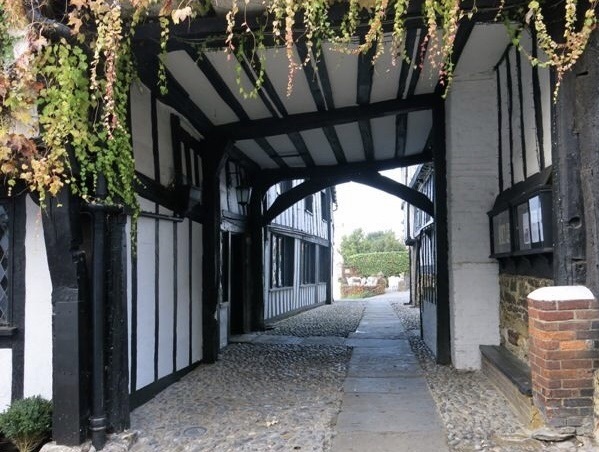 Local smugglers, the Hawkhurst Gang, used this as their ‘local’ in the 1730s and no doubt made use if the secret passageways built into the fabric of the building. 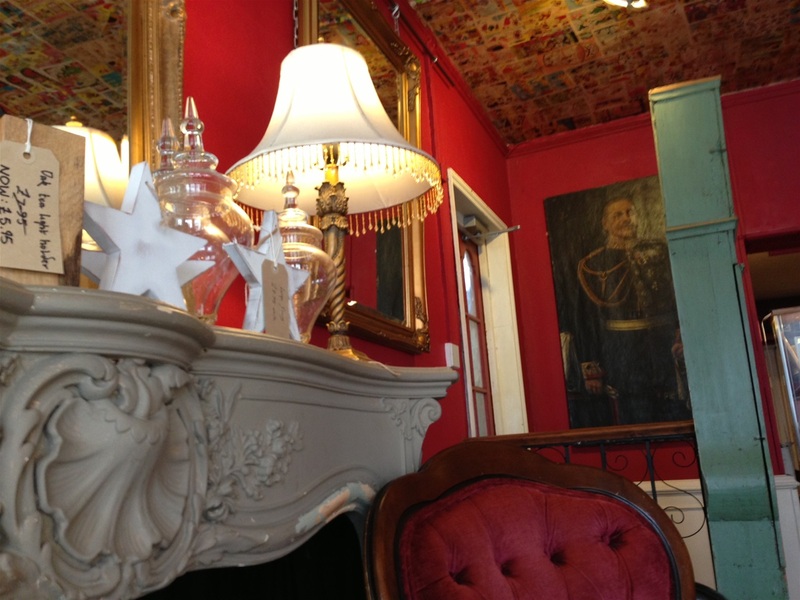 Today, it’s a charming place to rest weary feet, have a drink, eat good food or even stay the night. Back down on the quayside the river was now fully replenished with a pair of swans serving as backdrop to the stalls of a farmers’ market.